Provide a single platform for all customer engagement, make sure customers get the service they deserve. 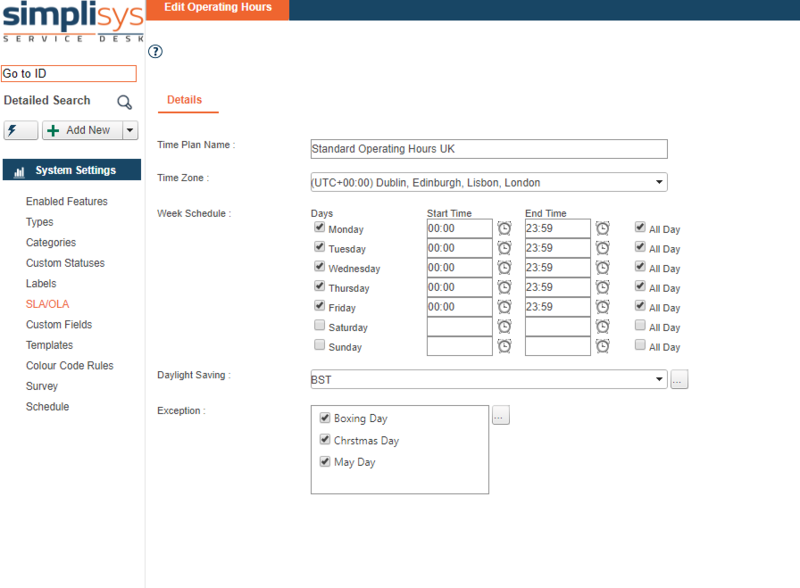 Simplisys service desk ensures consistent, timely and accurate responses to all. Improve customer satisfaction and retention rates with an intelligent client engagement solution. Take all inquiries from multiple channels and manage in one simple to use interface ensuring customers get concise, consistent and speedy resolutions regardless of who handles the call. 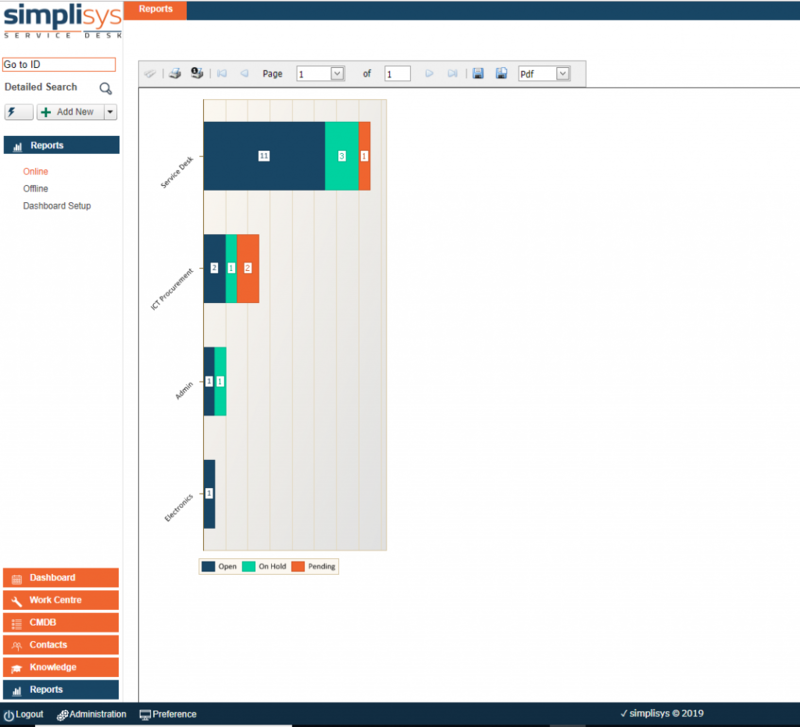 Simplisys Service Desk takes customer engagement post sale to new levels, it is designed to improve service levels and reduce management costs. It is feature-rich out of the box, highly configurable and integrates seamlessly with business processes and rules to deliver significant business benefits. The intelligent design is built around a central incident/request management system that allows a single system to be used by multiple departments, to ensure technical questions or straight forward health and safety or quality issues etc. are dealt with in a timely courteous manner. 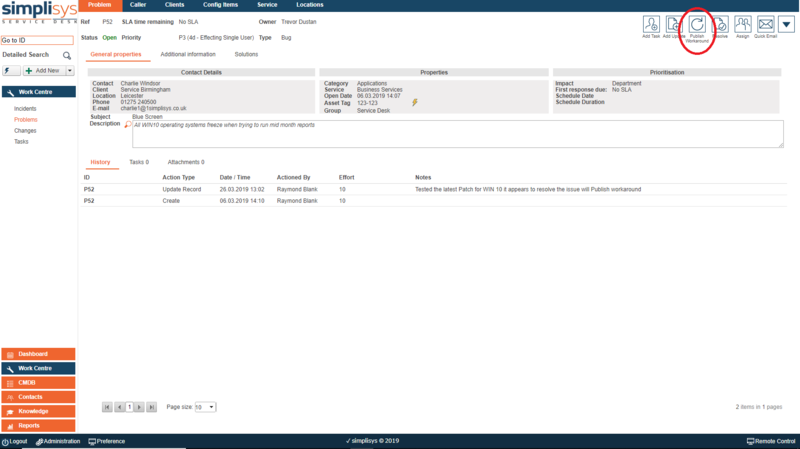 Centrally log, assign and track cases, manage workflows, monitor progress; produce reports and case histories. Link problems, incidents and change requests, and publish known errors and workarounds to the Knowledge Base. Maintain accurate history of Cases by Unique Identifier. Follow Corporate Policy to ensure consistent responses. 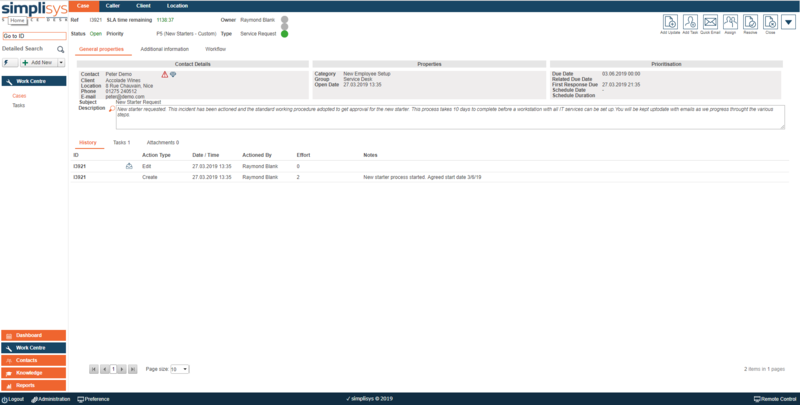 Manage Response and Resolution Times based on Policy. Track Cases that are high profile. 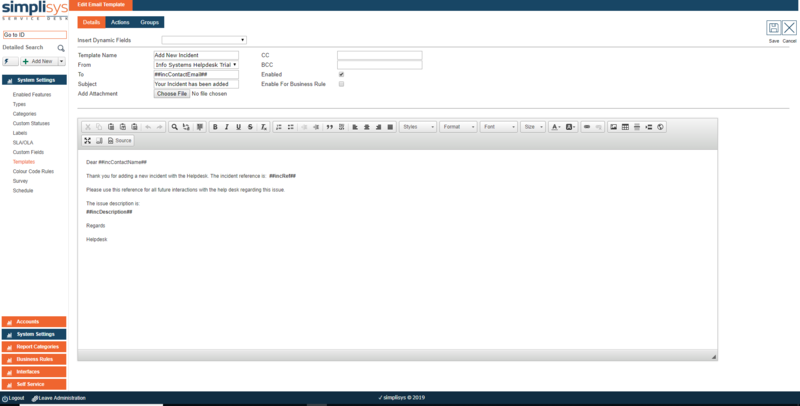 Create standard response email templates. Quickly create Call Templates with link to Config Items. Schedule Quick Calls for Housekeeping Tasks i.e. Check Back-ups or Site Visits. Pre-populate Add New Screen with Template when Selected. 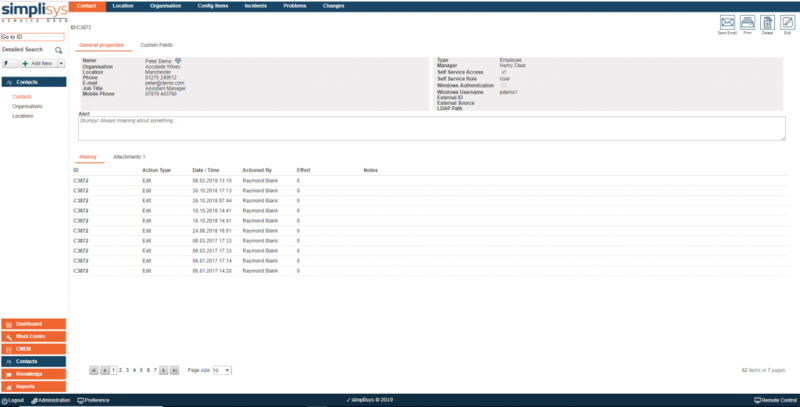 Enable 2nd Line to Manage Problems and Publish Known Errors. Work Collaboratively as a Team - Known Errors Dynamically Presented as 'Knowledge' to Front Line. Be Pro-active Instead of Re-active. Increase Service Performance with Tried and Tested Workarounds. Prevent Repeat Problems being sent to 2nd Line. Retain ownership and assigned Tasks, internal and external. Prioritise all Issues and be alerted to progress thresholds. 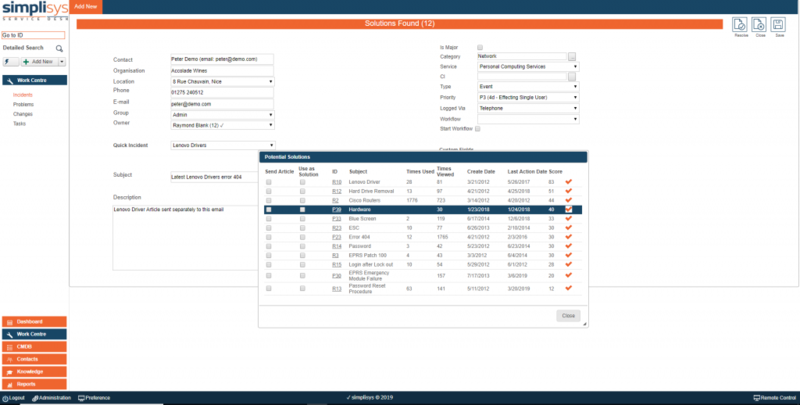 Easily manage client-specific, department-specific or corporate-wide SLAs. 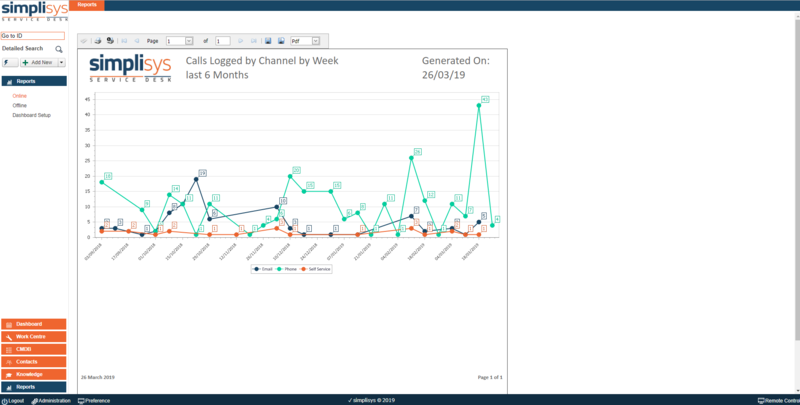 Monitor and manage teams’ performance (KPIs) with OLAs. Over 100 Standard Reports - save to Favorites. Sort reports by categories for quick recovery. Schedule reports to be emailed to both system users and non-service desk staff. Sophisticated trending and audit reports as standard. Output data in almost any format including XLS as standard. Online and Off line reports. 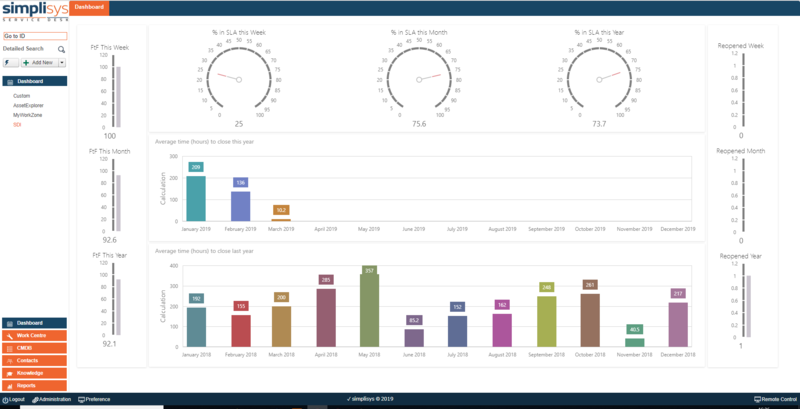 Personal dashboard views keep users updated of changes in the system. 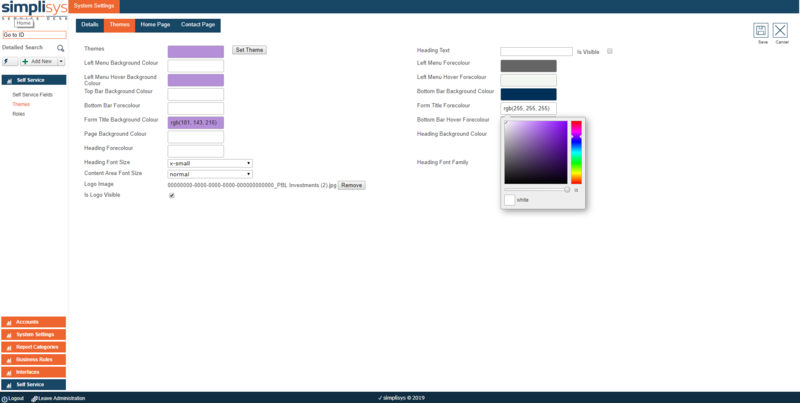 Interactive dashboards enable drill down to detailed views. 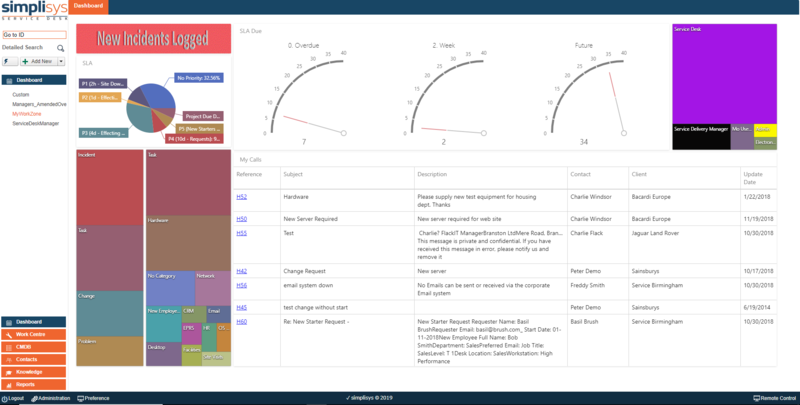 Management dashboards provide real time overview of the support service. 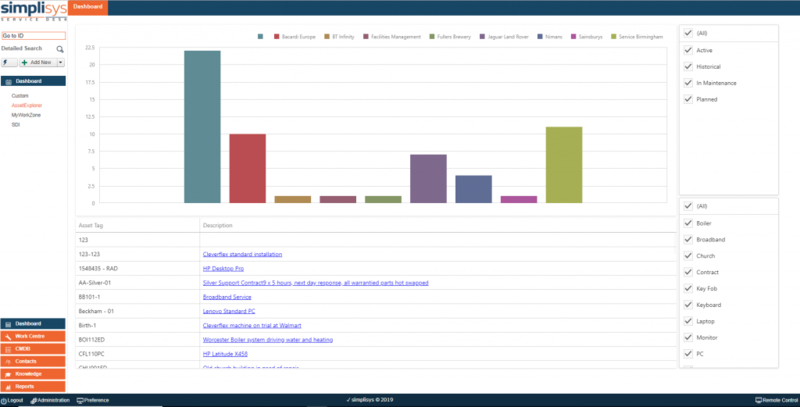 8 standard Dashboard to choose from based on Role including Industry Metrics and Asset/Service Explorer. Multiple dashboards can be configured based on role. Display an overview of the support service on a large screen in the office. Choose from one of many standard reports or create your own to be displayed. 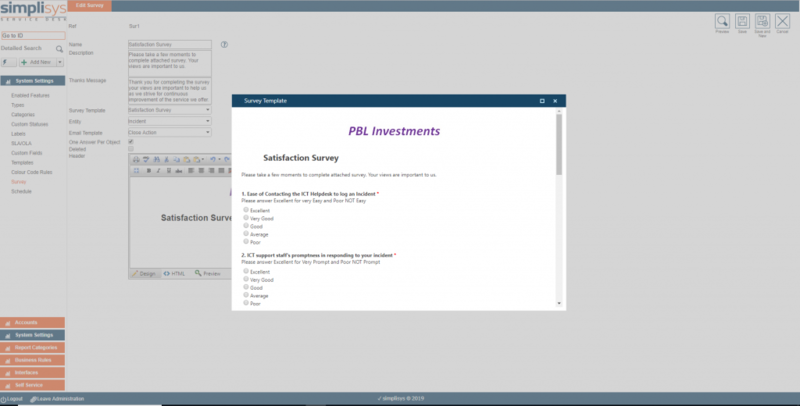 Easily create survey templates that can be re-used i.e satisfaction, projects. Send Surveys post Incident or to user groups post project. Link templates to surveys and view standard reports of survey-specific results. Drill into results for detailed view of answers. Push surveys out to individuals or groups i.e clients as required for instant feedback. Create complex or simple surveys to suit requirements. Keep up to date records of all internal personnel. 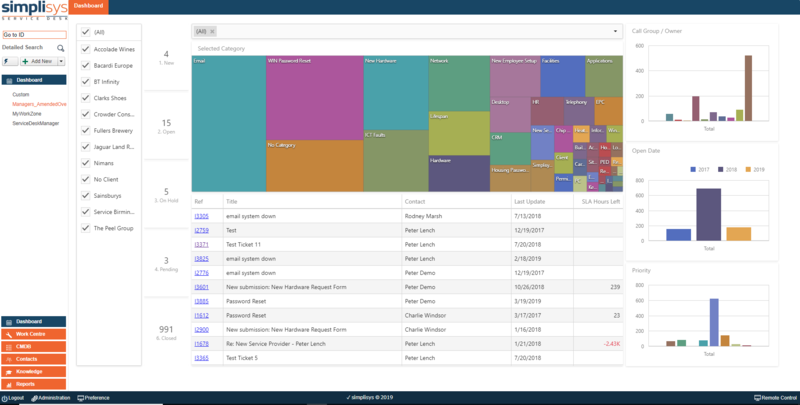 Build a good employee data base. Have all contact details readily available to enable finding colleagues quickly. Add new contacts on the fly. Integrate with Active Directory or other HR system. 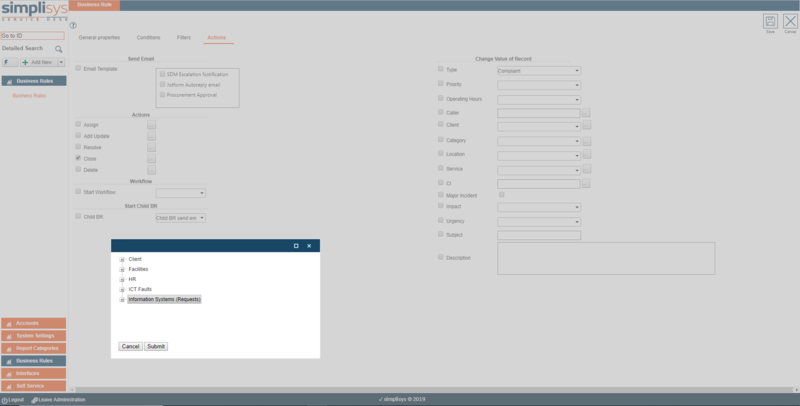 Manage a list of all end users (customers) by integration with third party applications like CRM. Spot any further sales opportunities with current customers. Manage multiple data sources in one application. Have all contacts details ready available to enable finding callers quickly. Add new callers on the fly. Articles and Problems in the “Known Error” dynamically present when call logging to facilitate higher close rates at first contact. Extend dynamic knowledge management to self-service portal. Further restrict articles that are displayed dynamically and allow user to close call in self-service by using an article. 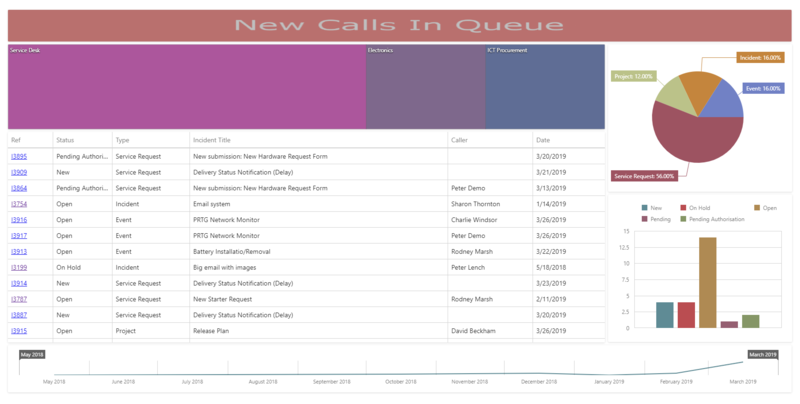 Call statistics maintained even when no interaction with the client. Configuration not customisation means needs are met yet upgrades do not impact system configuration. Quick and easy system set up without the need for extended training courses. 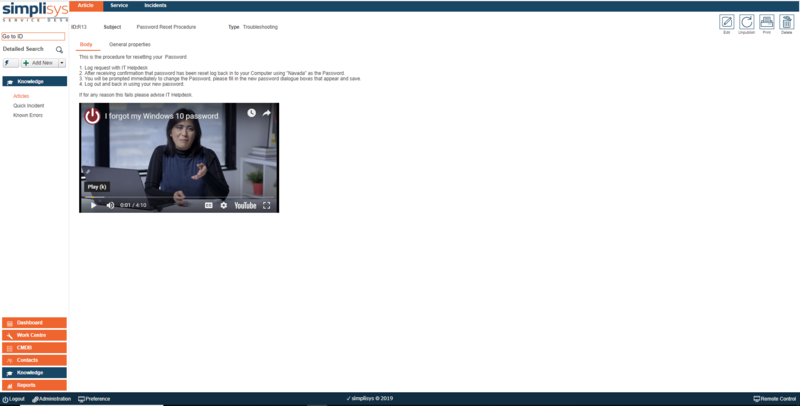 No need to learn bespoke scripting language due to intuitive drag and drop, point and click technology. 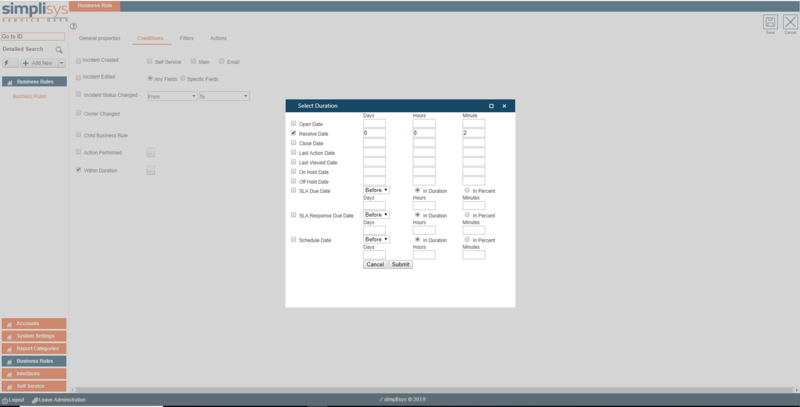 Drag and Drop, Point and Click and Boolean Logic make for easy configuration. “Intuitive by design” there is no need to learn scripting language to set up new business rules. Limited by users own imagination – Simply Smart. Boolean logic ensures administrators can create rules easily. Ensure key stake holders are alerted to specific events. Automatically re-assign or change the status based on events. 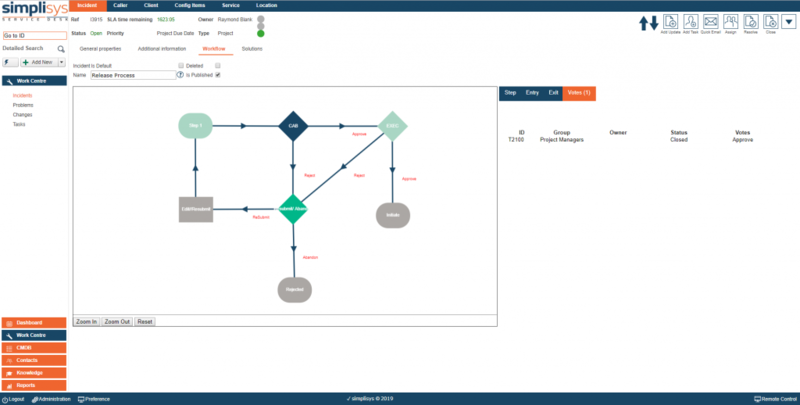 Familiar Visio like look and feel. Ensure working practices are adopted and followed. 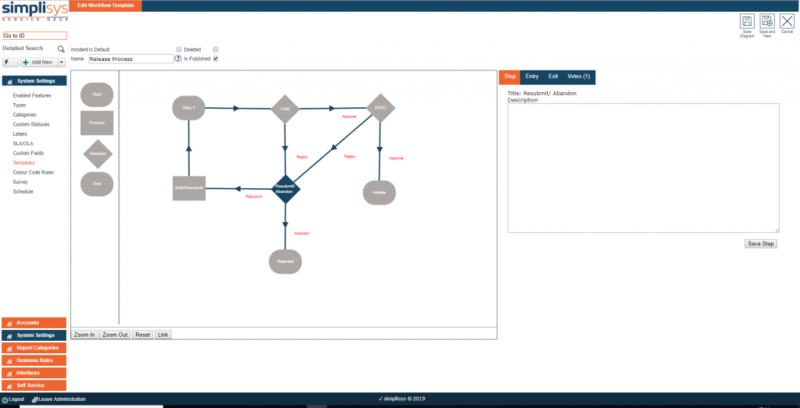 Quick graphical view of the process is in real time - identify bottlenecks. 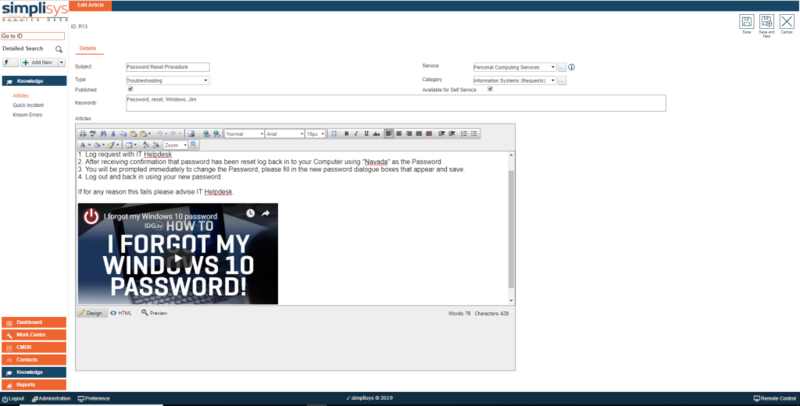 Restrict who can edit or create workflows based on role. Manage multiple data sources i.e. Active Directory, HR System , SCCM or CRM etc. Automate power shell scripts to run in the local network e.g. password resets. 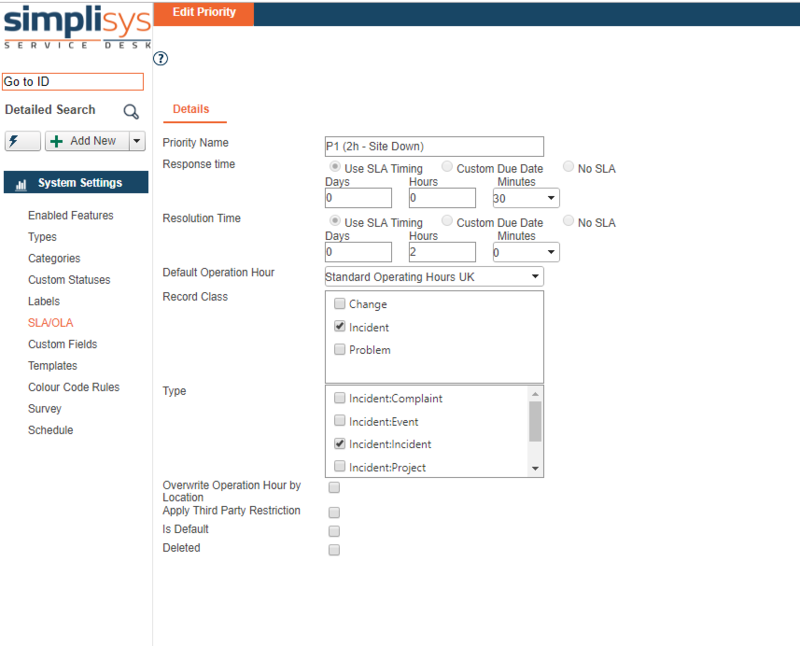 Easy creation of schedules for Incidents and or Reports. Routine incident schedules could include housekeeping or planned maintenance tasks. View when schedule will next run and linked objects. Determine preferred output for Reports i.e. PDF, XLS etc. 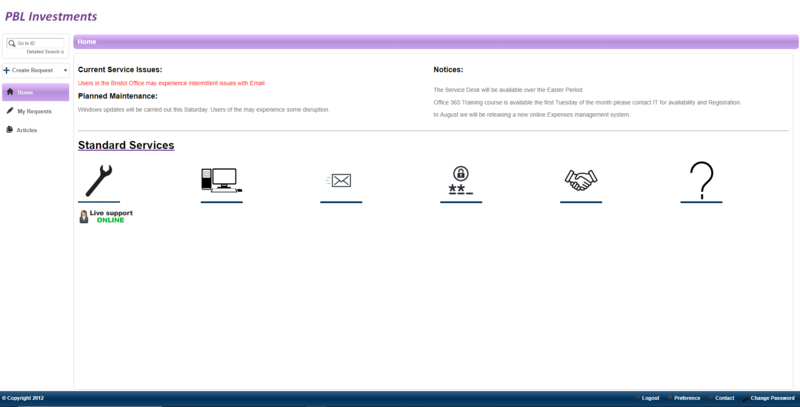 Central IT service create branded portals for each Business Unit. Publish Client Specific reports to the Clients Home page. Auto assign issues to the relevant department/team. Control access to sensitive records e.g. HR issues. Enable third party (contractors) access to the system and restrict what they can see and do. Flexible concurrent licensing enables infrequent users to authorise changes. 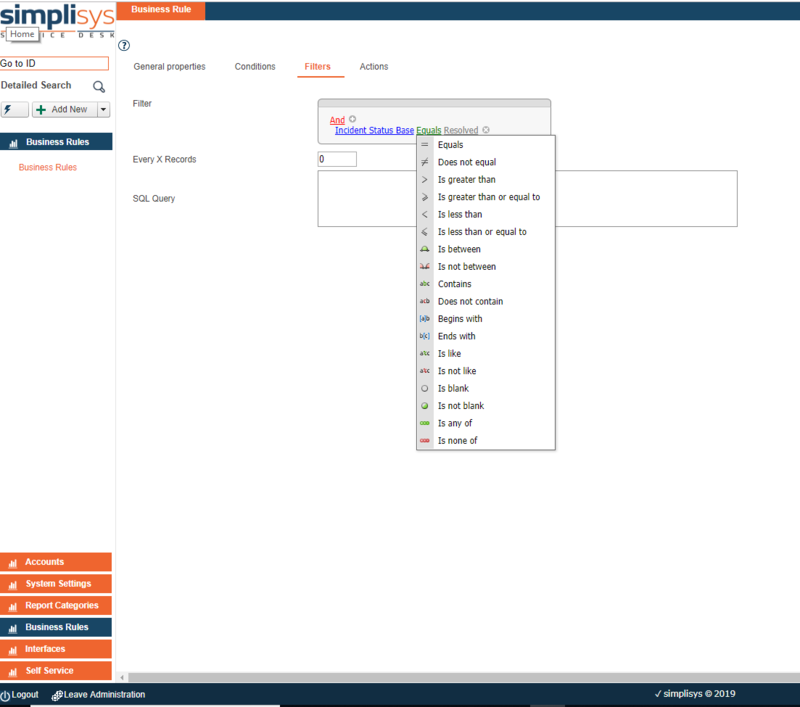 Simplisys Service Desk includes an Integration Module which facilitates integration with third party applications; out of the box Simplisys integrates with various email applications including MS Exchange, Office 365, Google Mail, Web Mail and Active Directory for Single Sign On and LDAP. 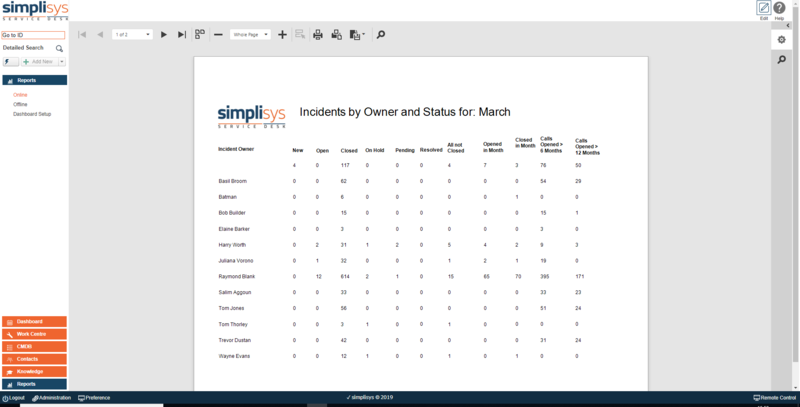 Simplisys Service Desk’s powerful Business Rules Engine can also trigger actions on third party software and the flexible integration modules allow integration with any third party software. 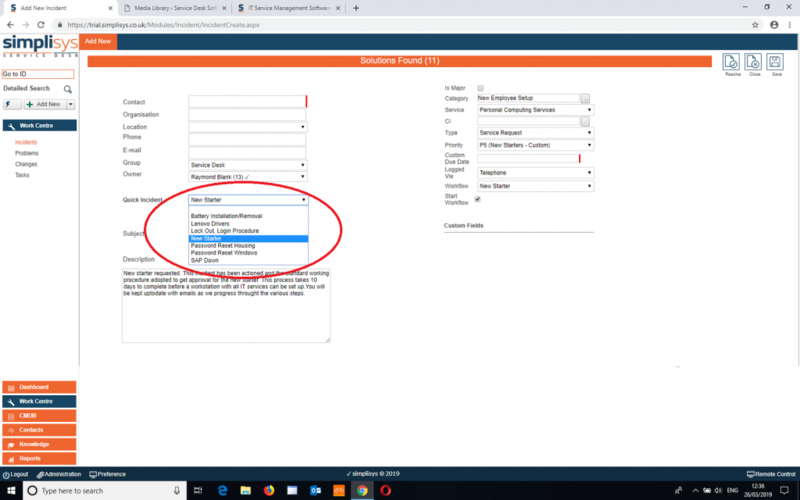 The service desk design brief was to develop a product that could underpin the working practices set out in ITIL but also be quickly and easily configured to support current or new working practices using existing terminology. Our approach to implementation is to work closely with our customers, understanding requirements and reasons for change and ensuring that projects exceed expectations. © 2019 Simplisys Ltd. All rights reserved.